One of the biggest hidden benefits of an integrated stove system, like a Jetboil, is its ability to be used inside a tent. Most people rarely do this since it seems so risky, but, if you set it up right there is no need to venture out of your sleeping bag and into a blizzard just to have a hot cup of coffee. First, let me say that cooking inside your tent is an activity that, if you decide to do it, you preform at your own risk. I am in no way stating that cooking inside your tent is a safe activity. The potential to build up lethal levels of carbon monoxide, melt gear/set your tent on fire, or cover yourself and your gear in scalding water are all present – there is a reason the manufacturer tells you not to do this. But, if you are forced to cook inside your tent there are some steps you can take to hopefully mitigate the risks you face. Lets take a look at how I set the stove up inside the tent, the primary risks of using a Jetboil in your tent and some ways you can avoid them. The first step is to hang the stove rather than set it on the ground. I find this is a much more stable method of using my Jetboil inside the tent. You can’t do this with a normal stove – since normal stoves don’t physically attach to the pot – so if you are going to try this out you will need a Jetboil style setup. To effectively hang the stove I take a pretty simple approach. 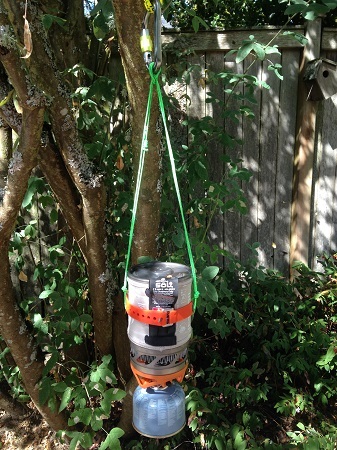 Tie some cord to a ski strap and attach the strap to the pot and hang the unit from a tent pole located in the doorway of my tent using a carabineer. 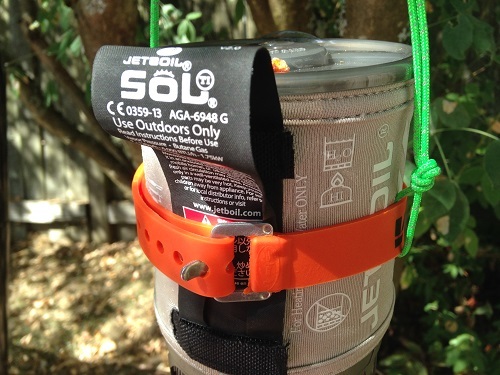 Jetboil, and most other integrated stove manufacturer’s, sell hanging kits if you are looking for something a little more official but I’ve never seen the need. Like this… but in the tent. A couple of notes. First – I like this setup because it uses gear that is already part of the emergency kit I always bring with me. I generally don’t plan on being trapped in a tent so having the gear to hang the stove by default is a requirement. Second – I also appreciate this approach because I can rig the setup while the stove is in my lap and then hang it up quickly and easily using the carabineer. I can also take the stove down easily without risking burns by quickly unclipping the carabineer. This is key. If you are messing around with things in an awkward, contorted, position while the stove is hanging you are setting yourself up for burns. Third – don’t fill the pot too full. A water level 3 inches below the top of the pot should be good. If you fill the pot too full it will overflow when it gets to a rolling boil. You don’t want to risk an explosion of hot water in your tent. Hanging the stove helps alleviate my primary fear when it comes to using a stove inside the tent. I am clumsy. I am especially clumsy before I’ve had my coffee in the morning. If I’m going to get hurt cooking inside my tent I’m willing to bet its because I either knock the pot over and spill boiling hot water all over myself or I knock both the pot and the stove over and light something on fire. You can’t knock over a stove if its hanging up. The other primary fear people have is the buildup of poisoious gas inside the tent. This could especially be true if you are in a very tightly sealed tent – think a 4 season single wall tent that has been covered by snow. This comes down to common sense. Open up the door and vestibule a bit to make sure you have some ventilation. Use some common sense here to judge if your ventilation is enough. So there you have it. That is how I hang my stove to cook inside my tent when I don’t want to brave the elements. You might also want to hang your stove (either inside or outside the tent) when you are camping on snow. Having your stove sit in the snow will significantly degrade fuel performance – cold fuel won’t work as well. Hanging your stove keeps the canister out of the snow. Other cold weather tips include putting your fuel canister in your sleeping bag at night to keep it warm and ready to go for the morning. This entry was posted in Activities, Activities, Alpine Mountineering, Articles, Activities, Backpacking, Brands, Gear, Camp Kitchen, Gear, Brands, Jetboil, Activities, Ski Mountaineering, Gear, Camp Kitchen, Stove. I'm a wilderness enthusiast who likes to focus on maintaining a lightweight pack to maximize my outdoor experience. I hold to the mantra that the lighter the pack the further and faster you can travel, but, I wouldn't consider myself "ultralight". I appreciate gear that has been reduced down to its essential features to provide an elegant and comfortable solution that is simple to use and effective in achieving its purpose. « Is Tenkara for you?